You will find here the latest hijab fashion tips and ideas to suit your Islamic clothing requirements and modest clothing needs. Top tips to drape your hijab in style without compromising our Islamic values. If you have just started wearing hijab or if you would like hijab fashion tips on your hijab style, here you will find some hijab tips and ideas that may be very helpful for your everyday style solutions. I'm sure you would like more variation in the way you wear the hijab, especially when your usual wrap sometimes tend to get a bit boring. In reality, there are many ways in which you can present your best hijab style to break the monotonous. How to wear hijab so we look our best is essential question for every Muslimah. Here are 3 basic rules in hijab fashion tips. First - know and love your appearance and understand who you are. Second - dress to express our creativity and feel good for the occasion. Third - know what's current and adapt accessories to trends, while keeping core wardrobe components appropriate to our Islamic values. In addition to the basic rules, here are other hijab fashion tips on how to wear hijab in easy and simple ways that you can handle. With this information, you will feel confident and comfortable to walk out with your lovely hijab held high for the sake of Allah. If you wear ruffle tops or dress, avoid any pleated style hijab on the shoulders or around the neck. It is not a complementary to your overall appearance. The golden rule for the hijab fashion tips is to go for the opposite texture with your clothing. The more flattering your clothes is the simpler will be the hijab style and fashion. Avoid anything fussy or bulky. This serves those with the trendiest as well as the most modest among us. Details should draw eye toward your best features. Everyone has a best feature. Find yours and work around it. If you really want to wear that colourful summer dress or maxi and make it work with hijab, wear a simple muted colour hijab. The least you call for attention, the more flattering you will look. If your outfit has two colours, your hijab should match the main colour of your outfit. At the same time pink hijab with pink top and pink shoes is not a clever option as well. Study a little about colours and colour combinations. Find out more in here hijab colour coordination. When you dress out, choose one focal point of your attire. If you want to make your hijab as a focal point by choosing Spanish style braided hijab, your attire should be simple plain tunic with straight cut pants. Should you choose flattering printed skirt matches it with smart solid color top and plain wrap hijab barring any fancy folds. Accessories such as hijab pins, brooches, fashion jewelleries, watches, sunglasses, shoes, and handbags are subtle and yet effective ways to imply that you know how to dress with flair. Choose cleverly your accessories. A few interesting pieces can add a trendy touch to your styles and last for years. However, be conscious not to wear bright colour hijab, sparkly tops with lots of bangles and accessories at the same time. Avoid too many different things going on with your outfit. Stay away from fabrics such as jersey or spandex blends as they have a tendency to cling to the body especially in the areas that you do not want them to. Jersey top or tunic or maxi dress is going to cling in all the wrong places. You might skip to wear it outside. However, a top made of spandex blend would be wearable if layered under a coat or jacket. 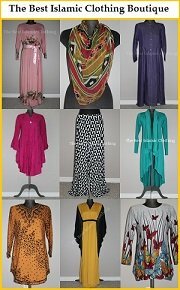 Hijabi wearable clothing like tunic, long shirt, maxi dresses, long skirt, caftan style top and head scarves can be in season and out of season. If these garments are on trend, shops will have them available in various styles and colours. This is the time to buy. Hijab colour coordination is a must but do not go overboard. You could colour coordinate your clothes with hijab, but the colours are not necessarily of the same shade and texture. You could wear a brown tunic and pants and match it with shade of cream hijab; or wear black top and match it with lime green hijab. It is as if that you never plan what you are going to wear or never buy an outfit and matching hijab at the same time. As a common rule of human relation, no impression is made by one who is trying too hard! Subtle effort rules and always works the best. The same rule of choosing the right hijab style apply to wearing hijab accessories such as underscarves whether they are made of cotton blend or lace. Underscarves or bonnets are essential for keeping your hijab in place. For added friction, wear a lace hijab over a cotton blend underscarf. Long face - lowering an underscarf further down your forehead will shorten your face and make your face wider. You look gracious this way as this style helps create an oval shape to your face. Round face - wearing an underscarf a bit of it, not more than 1 inch down from your forehead or none at all. More here about hijab guide including coverage & size of the hijab hijab fabric, hijab for different occasions, hijab color and design. The key to it is to wear hijab with the attitude - we wear hijab because Allah has told us to do so. With that in mind we can never go wrong; the rest is an enhancement to our overall appearance, whatever hijab style we choose to wear. There is a hijab fashion tips book on all about hijab style that provides tutorials that teach you how to do basic and new hijab styles, hijab fashion tips, and more. The information also include basic draping tips, underscarf variations, rectangular scarf styles, different hijab styles with square and triangular scarves. There are also tuturials on how to wear turban style hijab, variations with hooded, caps and hats for modest look and hijab style. As you enjoy and find inspiration from the ideas here, would you like to share with us and submit your own Hijab tips, ideas and photos. You'll be taking part in creating and developing the ‘best’ Islamic clothing ideas resource that's absolutely FREE for every Muslimah to share here, InsyaAllah! Describe your tips and ideas here. Just enter any sort of information that'll help inspire others to do it themselves.